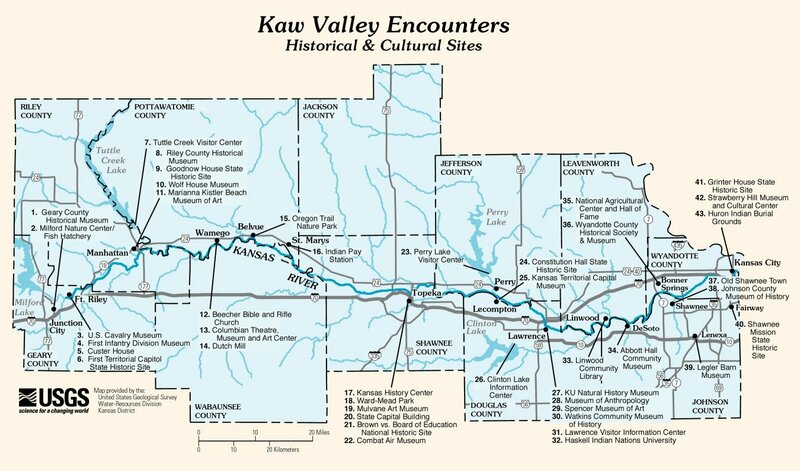 - Map(221KB) of the Historical and Cultural Sites along the Kaw, courtesy of USGS. See the KANSAS PADDLER Home Page (http://www.kansas.net/~tjhittle) for (Kansas USGS) river flow information and Kansas Canoe Association trip information. 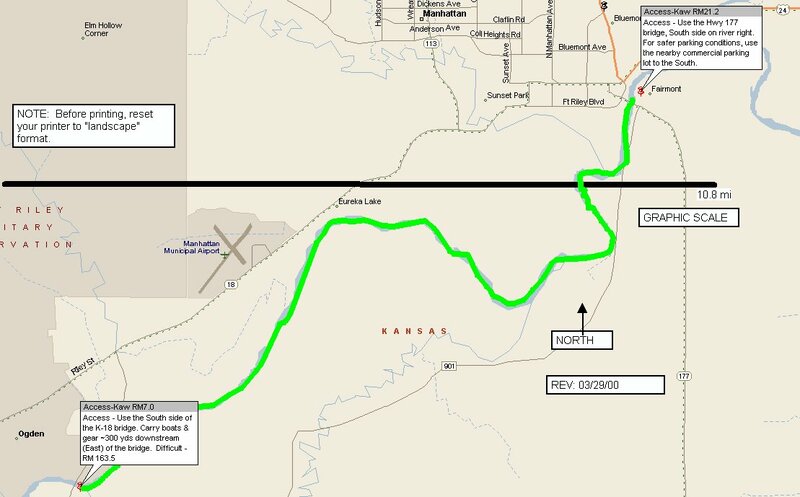 Remember that all Kansas streams but the Kansas River, Arkansas River, and Missouri River flow over "private property", as interpreted by the Kansas Supreme Court. Seek permission to float all private streams. Use your best judgement and extreme caution to avoid the legal consequences of trespass. Class Difficulty Ratings are subjective. Use your own judgement. There are elements of danger in each of the streams listed. Flow levels are easiest checked by logging onto the Kansas USGS Real Time Gauge link under the KANSAS PADDLER Home Page Water Conditions for River Runners page. Minimum Recommended Flows / NOTE: Maximum Recommended flows are the product of weather, skill level, experience, and craft, and are therefore not listed. 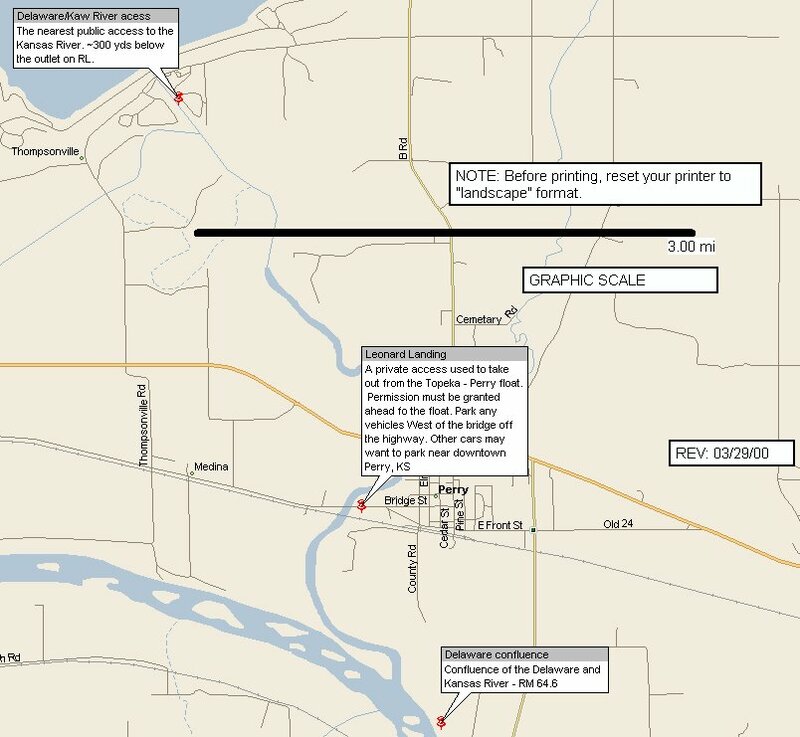 NOTE: Kansas River Mileage based on a 1978 Bank Erosion Inventory Study and Map by the USACOE. Most Kansas streams have poor access. This means generally muddy bank conditions, tall weeds, some steep and slippery slopes. Always watch for poison ivy and stinging nettle. Wear long pants and tall rubber boots, then change into more comfortable clothes at the closest sand or gravel bar after launching. Water quality is generally poor. Wash your hands and disinfect prior to eating. Winds are always a concern on the Kansas River. Watch the weather predictions prior to your float trip. Strainers and logjams are always a concern. Steer your craft away from these. At minimum stream flows, considerable maneuvering will be required, with frequent drags over shallow sand. Take-out: K-18 bridge, aka, Ogden bypass bridge (RL), RM 163.5. This access is on the northwest side of the bridge in Riley County. Just follow the fisherman's path to the river, staying underneath the bridge. 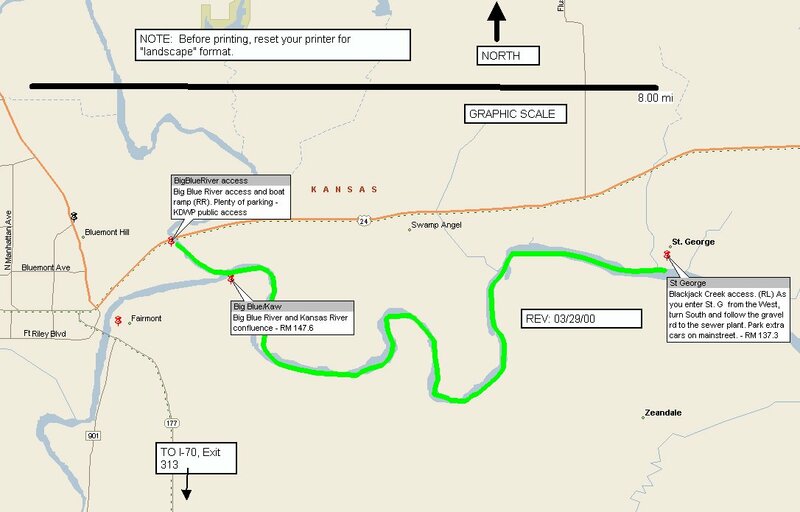 Good sand bar camping; passes through Ft. Riley; scenic; goes past First Territorial Capital, can stop upstream and hike in (1/8 mi.) on their river trail to see the museum. Watch for trail rails on the (RL) side. 1,100 cfs / Flow levels are easiest checked by logging onto the Kansas USGS Real Time Gauge link under the KANSAS PADDLER Home Page Water Conditions for River Runners page. Put-in: One mile below the K-18 bridge off K-18 & Walnut Street in Ogden - (RL), RM 164.5. 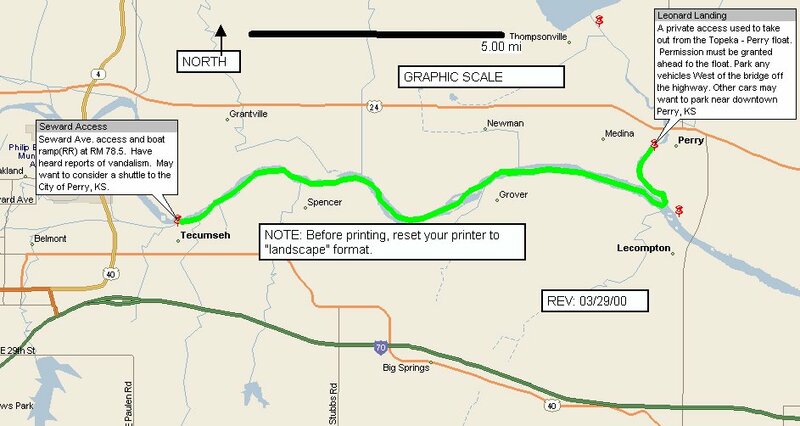 This new access is on river left & located in Riley County. Just find the colorful apartments 1/2 mile south of the K-18 bridge. Then follow the old dirt access road east to the river. 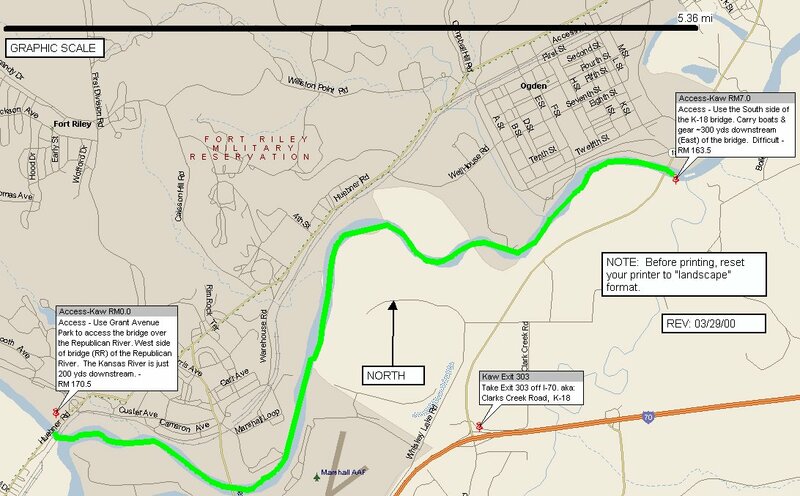 It may be a little hard to find but you will be thanking me later for pointing this new river access out to you. Take-out: K-177 bridge (RR) , aka Fairmont Park Boat Ramp, off McDowell Cr. Rd at RM 149.3. This is a new access, dedicated in 2008. You will love this access! 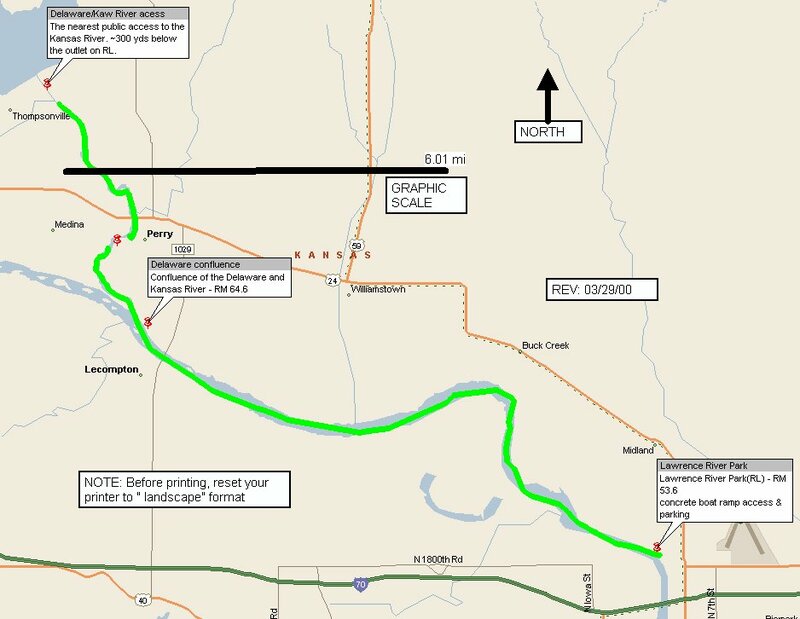 Alternate Take-out: Continue down to the Hwy 24 - Blue River confluence at RM 147.6 boat ramp and paddle upstream 3/4 mile. If Tuttle Cr. Reservoir is releasing >4,000 cfs, DO NOT ATTEMPT TO PLAN TO PADDLE UPSTREAM. Take-out upstream under the Hwy 177 Bridge, aka Fairmont Park Boat Ramp, instead. 1,100 cfs / At minimum stream flows, considerable maneuvering will be required, with frequent drags over shallow sand. Flow levels are easiest checked by logging onto the Kansas USGS Real Time Gauge link under the KANSAS PADDLER Home Page Water Conditions for River Runners page. St. George River Park via the sewer treatment plant road & access (RL) RM 137.3 - Access is now great due to a brand new concrete boat ramp & parking area, developed by the City of St. George. This was a product of the efforts of the Westar Energy Green Team, Kansas Canoe Association, Friends of the Kaw, American Flyfishers Association, Hittle Landscape Architects, and numerous private donations. Directions: After entering St. George, KS on the Old Military Trail Rd, continue past the Post Office on 1st street, to Lincoln street (landmark is the old gas station) and turn south on this road near Blackjack Creek going about 1/3 mile over the RR tracks and to the sewer treatment plant & new river park. It even has a bathroom. 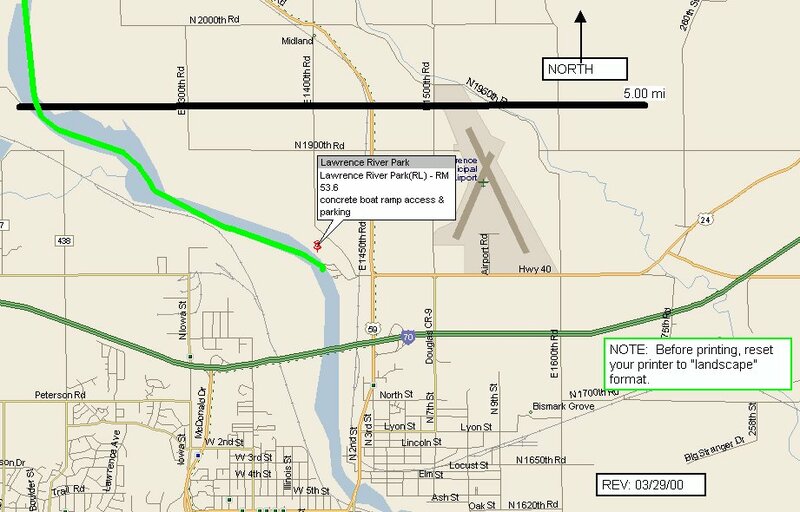 Put-in: St. George River Park via the Blackack Creek & sewer treatment plant road & access (RL) RM 137.3 - This new access is now A-1 due to a brand new concrete boat ramp & parking area, developed by the City of St. George. This was a product of the efforts of the Westar Energy Green Team, Kansas Canoe & Kayak Association, Friends of the Kaw, American Flyfishers Association, Hittle Landscape Architects, and numerous private donations. Directions: After entering St. George, KS on the Old Military Trail Rd, continue past the Post Office on 1st street, to Lincoln street (landmark is the old gas station) and turn south on this road near Blackjack Creek going about 1/3 mile over the RR tracks and to the sewer treatment plant & new river park. 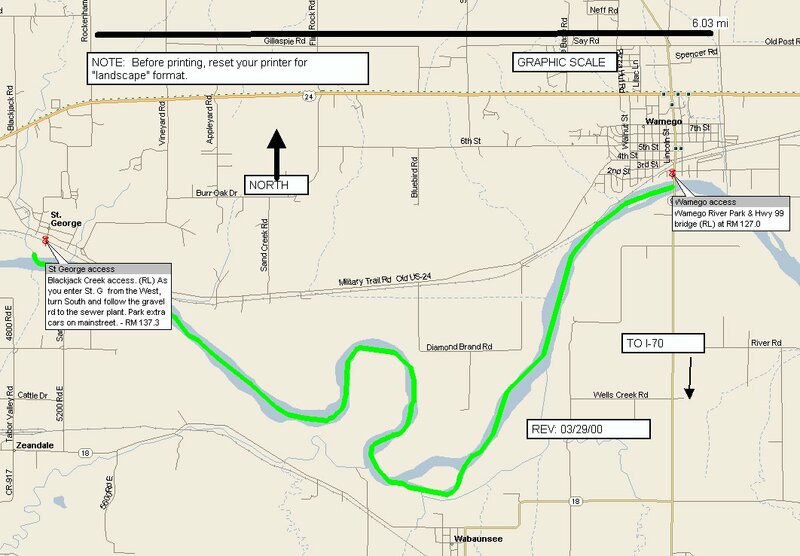 Take-out: New Hwy 99 Wamego bridge, aka River Park Boat Ramp & access (RL) - RM 127.0. This is a brand new access, dedicated in 2008. You will love this access too! 1500 cfs / At minimum stream flows, considerable maneuvering will be required, with frequent drags over shallow sand. Flow levels are easiest checked by logging onto the Kansas USGS Real Time Gauge link under the KANSAS PADDLER Home Page Water Conditions for River Runners page. Take-out opt. 1: Silver Lake access (RL) - RM 95.0. This also is a steep banked primitive access. Take ropes along. SPECIAL CAUTION & WARNING: Option 2: Takes you over the DANGEROUS Topeka Water plant dam/weir. This low head dam should be scouted from the North or River Left and portaged on River Left. You will notice a sign well ahead of the dam, but keep moving towards the North side of the river to portage. This is probably the least attractive section of the Kaw. Also takes you past the Oakland Sewage Treatment plant outlet in Topeka, KS. 2000 cfs / Flow levels are easiest checked by logging onto the Kansas USGS Real Time Gauge link under the KANSAS PADDLER Home Page Water Conditions for River Runners page. 1500 cfs / Flow levels are easiest checked by logging onto the Kansas USGS Real Time Gauge link under the KANSAS PADDLER Home Page Water Conditions for River Runners page. Below Bowersok Dam (RL) - in Lawrence, KS - RM 50.0 / Take 2nd St. (Hwy. 40/59) north to the first stoplight at Locust Street by Johnies' Tavern. Turn right (east) on Locust and go 5 blocks to 7th St. Turn right (south) on 7th and follow 3 blocks until it ends at a hard left at the river levee. Follow the turn left and go east one long block on Ash to 8th St. Turn right and go about half a block to the River. The access has a good size parking lot, concrete ramp and a trash barrel. CAUTION: The boulder dam immediately below the I-435 bridge is a formidable portage for loaded boats. Take your time and use extreme caution when portaging on river left.